A wonderful sampling of orchard-fresh fruit and gourmet treats! A special gift for a friend, family member or business associate, our charming gift basket is a welcome present for any occasion! 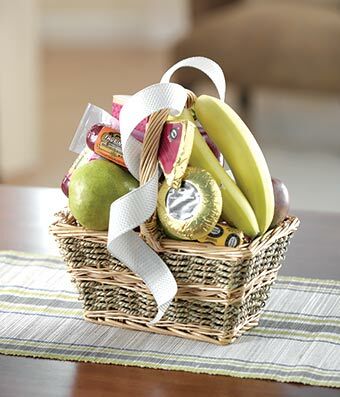 Brimming with crunchy apples, crisp pears, fresh bananas, complemented by fine cheeses and more. Measures approximately 13"H x 10"W x 12"D.